Let's have some coffee together! The other days I saw a cute image on Instagram from Craftin Desert Divas which was a freebie for the Fall Coffee Lovers Blog Hop and I needed to make a card with ! It is just too cute not to! So for my card I colored my cute bear with Spectrum Noirs Alcohol Markers. Because I wanted to have a interactive card I wanted to keep my card simple so I created a ink blending background with Peacock Feathers and Antique Linen Distress inks. For the interactive part of the card I just cut a channel into my front panel then grounded with foam tape leaving a side open for the ''pull'' tab which I also inked with the same inks. For the sentiments I used Create a Smile - Coffee first and the word Coffee I die cut Memory Box - Soup alphabet and created the word coffee. To finish up I added some Glossy Accents on top of the donut and to the coffee cup and some Pretty Pink Posh sequins! Thank you so much for stopping by! Have a amazing day! Today I want to share a card that I made for the Fall Coffee Lovers. 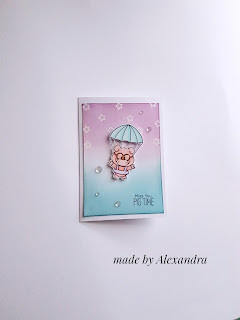 For this card I used the cute stamp set from MFT Happy Hedgehogs and for the cup of tee or coffee I used Create a smile Coffee First. 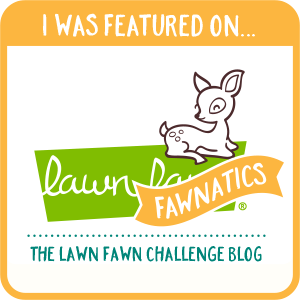 Also for the leaves I used MFT Harvest Buddies . For the coloring I decided to go with a no line markers coloring and I used Spectrum Noir Alcohol Markers and for the background I used Salty ocean distress ink and some red ink on my stash. 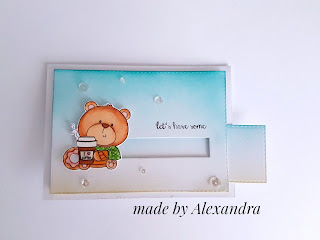 To finish my card I added the sentiment which is also from Harvest Buddies from MFT, adhered my critters and cup with foam tape to have a bit of dimension and my card was finished. 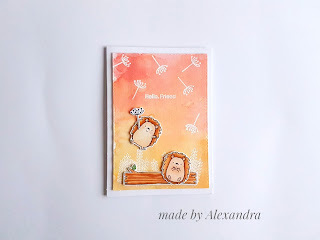 Today I am going to share with you a card that I made using Happy Hedgehogs stamp set from MFT. 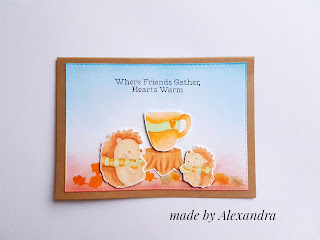 My card is telling a story : Two little friends are having some chit- chat on a cute autumn day! Suddently wind starts to blow very strong and bring some flowers near the two friends! One of them take a flower and the wind start to carry him away :) to find new adventures. For this card I created my background with Stabilo Markers on watercolor paper. After my background was dried I stamp and embossed the flowers on my card! The cute hedgehogs are colored with Spectrum Noir Alcohol markers! To finish my card I adhered the main panel to a white card with foam tape. To add a bit more dimension I adhered the hedgehogs with foam tape too. Thank you so much for stopping by! Have a great day! Challenge MFT Superstar Card Contest Task for two Tuesday Alles Neu -The stamp set from MFT- new to me! But it's so good to craft again and too post again on my blog. 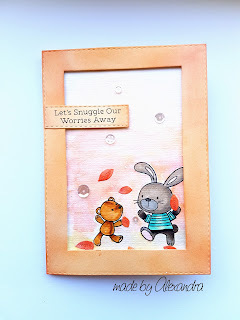 My inspiration for my card today was the sketch challenge from MFT challenge blog . 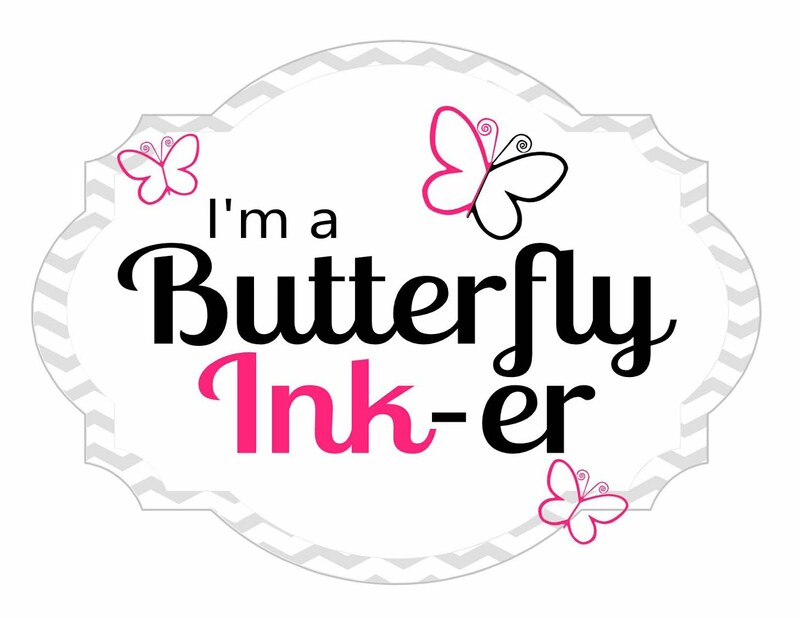 For my card I used MFT Hybrid black ink to stamp my critters onto watrecolor paper. The background is create using Stabilo markers and I wanted to give my card a fall touch so I used orange , red, brown and a bit of green for my colors. The critters are colored with Spectrum Noir Alcohol Markers and because I wanted them to play with leaves and I added some which I die cut with Create a Smile - Pocket Tag and inked them with red and orange ink. To finish up I added my frame and my sentiment which are adhered with foam tape! And of course I could not skip adding some Pretty Pink Posh sequins! Thank you so much for stopping by! Have a lovely day!